Students at the Ecole Polytechnique of Lausanne may soon drive across campus in up to 6 driverless shuttles developed by French company Induct. The Navia shuttles, of which the first was delivered to the university in December for testing, operate autonomously with a speed of up to 20km per hour. They are fully electric, are equipped with GPS, laser sensors, 3D cameras and can transport up to 8 persons. The shuttles are ideal for last mile transportation. As the laws in most European countries still require all cars to be operated by a driver they currently only can be operated in private areas – such as airports, business and amusement parks, shopping malls, university campuses etc. By removing the first/last mile hurdle, Induct’s shuttle technology has great potential for making public transport more appealing and effective. Compared to individual autonomous vehicles, they are also much easier to justify economically because the high costs of current autonomous technology (especially 3D sensors) are less of an issues for multi-passenger vehicles which clock so many more operating hours than private cars. Induct is not the only company focusing on autonomous shuttles. Google operates (or has operated?) a fleet of autonomous golf carts on their campus. 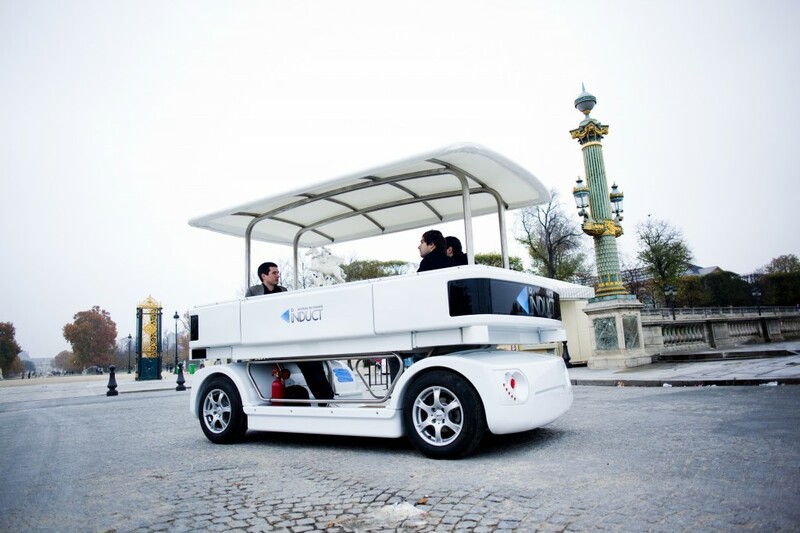 Robosoft, another French company also offers 2 types of such shuttles, which have been developed in the European CityMobil research project). The technology certainly has great potential to become a starting point for more efficient and environment-friendly autonomous people movers and buses. Hopefully the legal framework will be adapted soon to allow the operation of such shuttles in public. This applies especially to European countries which have been heavily financing research in such autonomous transportation systems for almost a decade (and are continuing to do so e.g. in the new CityMobil2 project).